Like many Green Party members, I wasn’t even born when UK citizens last voted on membership of the European Union. I’m glad that everyone will soon have their say. I’m also glad that the Green Party has such a positive, progressive vision for Europe. This referendum gives us a tremendous chance to talk openly about the EU – to discuss where it works, where it doesn’t, and the kind of Europe we want to see. However, time is short, with the referendum date now set for the 23 June. 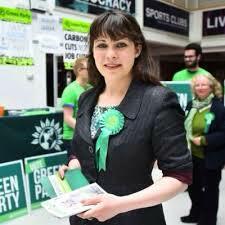 Whether it’s clean beaches, equal pay, the working time directive, or climate targets, I have no doubt that we are Greener In. By working together with our closest neighbours, we can secure better workers’ rights, human rights and environmental rights – here in the UK and across Europe. Our long-standing policy on the EU goes to the core of what we believe as Greens. We welcome this referendum, because we believe in democracy. We want to stay in the EU because we believe in internationalism and cooperation. And we’re using this referendum as an unprecedented opportunity to push for EU reform, because we believe passionately in fighting for stronger democracy and for stronger policies on social justice, environmental protection, and peace. Greens are about working together and getting stuck in for the common good – not walking away. We know Green members and supporters are the most pro-European among the British public. That doesn’t mean that everyone will agree. That’s fine. Last September, Green Party conference passed overwhelmingly a bold and ambitious motion to campaign passionately for a ‘remain’ vote in the EU referendum – in a way that builds support for our Party and wins people over to the Green vision for a better Europe. Now we have a date for the EU referendum – it’s up to all of us to turn that into action. What will make the most difference is not politicians on podiums, but conversations in community meetings, on local streets and on doorsteps all around the country. We know that the Green vision for Europe can be a vote winner. Last May, the Greens stood on a pro-migrant anti-scapegoating platform and garnered our best general election results ever. Yet the number of Brits who voted Green was even greater one year earlier – in the European elections, when Greens secured 1.2 million votes. Then, we celebrated the election of the UK’s third Green MEP – Molly Scott Cato – who’s be making a huge impact at the heart of the EU ever since – alongside our two other UK Green MEPs – Keith Taylor and Jean Lambert. After the referendum, I’m looking forward to celebrating not only our contribution to what I hope is a strong ‘remain’ vote, but also to the progress we’ve made in building a strong Green movement that will take us forward to secure radical reforms to the EU and elect even more Green politicians to the European Parliament in 2019.